I adopted Bobby the Shih Tzu – affectionately known as “The pirate – thief of hearts” in 2004, his age was estimated at 10 years old. Bobby is a joy, we have struggled at times due to his “episodes” finally diagnosed as Canine Cognitive Dysfunction – or Doggie dementia. I know his triggers and everything has been under control for the last 5 years. I’m overjoyed to have been able to have the privilege to spend so much time with him, I never imagined he would still be here 7 years later after being estimated at 10, I now tell people he is 7 and no one questions it, he definitely seems to be Benjamin Buttons aging backwards. Bobby is very attached to his brother Scooby and they spend most of their time intertwined on the couch fast asleep. 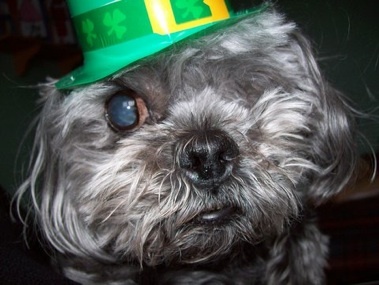 Bobby is terrified of cameras, however I was able to snap this pic of him, modelling his St Patrick’s Day hat.